It’s worth pointing out a few facts about this toy. The “oven” was a naked hot plate with an aluminum cover guaranteed to burn you if you didn’t lift it by the nose/handle. 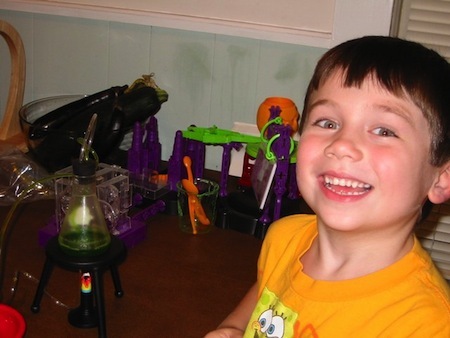 The Gobble De-Goop provided was just enough to make one or two of everything in the molds, which included flowers and butterflies as well as bugs and worms. Utilizing the classic “sell the blades, not the razor” tactic, Mattel hoped to drive a lucrative business in additional molds and goop. Unfortunately, the “candy” tasted horrible. Of the six flavors available – cherry, mint, cinnamon, root beer, licorice, and butterscotch – only the cinnamon was tolerable, probably because it masked the weird taste of the gel base. Incredible Edibles was eventually taken off the market, in part due to a rumor that one of the goop ingredients was carcinogenic (probably sodium cyclamate, a sweetener that was banned by the FDA after some spectacularly sensationalistic cancer claims), and in part due to the inherent safety issues that would accompany letting a child mess around with an unprotected hot plate. 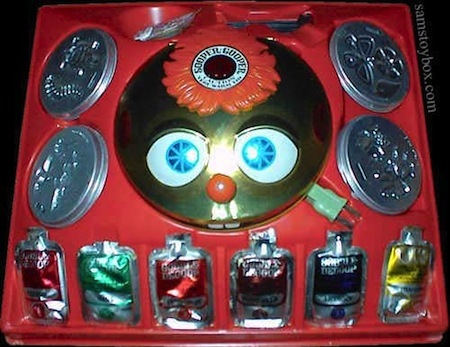 Mattel continued to market other hot plate based toys (they must have had a warehouse full of heating elements) that culminated in the Strange Change Machine, which is possibly the greatest toy I have ever owned. 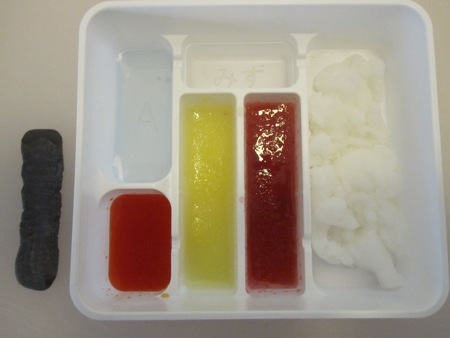 Instead of packages of gel that had to be baked, the lab came with packages of gelatin and other fizzy components that you mixed together in plastic beakers and test tubes. I kept the kit for years, buying refills whenever I saw them at stores. He Who Will Not Be Ignored loved making “gross stuff” with the lab, especially the “worms” that would form when you squirted one liquid mix into another. I had to have one of those kits, which I found for sale at White Rabbit Express. A few weeks later three kits arrived, and He Who and I tore into one. All of the information we needed was printed on the box, but in Japanese. Fortunately I have some limited ability with the language, and was able to translate the front. The title, tanoshii o-sushiya-san, translates to “fun sushi shop,” while the baners next to each sushi candy are maguro (tuna), tamago (sweet egg cake), ikura (salmon roe), and chirashi (scattered). The back of the box was another matter, well beyond my limited nihongo abilities. Just today, while assembling the links for this post, I discovered an english translation of the instructions, but, due to clever color-coding and packaging, I was able to figure out how to proceed. 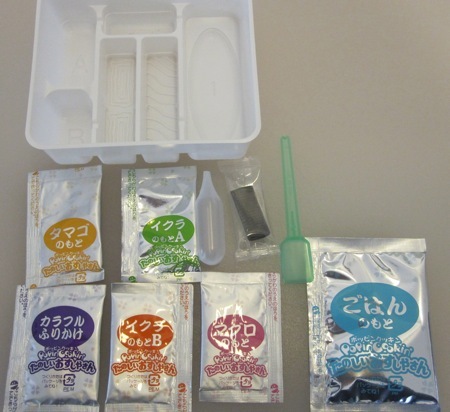 The box contains a plastic tray with molded compartments, six packets of stuff, a stirring paddle, a water dropper, and a packet of what looked like black chewing gum. 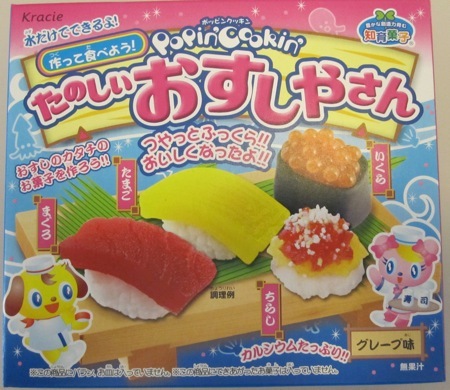 The larger light blue packet was labeled gohan (rice), the pink packet was maguro, and the yellow packet was tamago. The packets labeled A and B corresponded to compartments in the tray, which left the purple packet for us to figure out. But first, we mixed each candy in its corresponding compartment. In the video, the water dropper was used to fill the compartments to their respective fill lines – there’s a small compartment at the top center labeled mizu (water) – but I found it easier to pour water from a small measuring cup. We added each packet’s contents to the water, stirred with the paddle ansd let everything set. 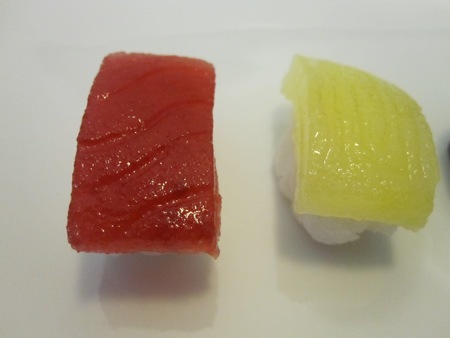 When we were done, we had grainy white “rice,” pinkish-purple “tuna,” and bright yellow “egg.” We flattened out the black gum to make a nori wrapper, and filed chambers A and B with their corresponding ingredients. Here’s where things got interesting. Using the dropper, we sucked up some of the orange liquid from compartment B and dropped it into the blue liquid in compartment A, where it formed perfect little spheres. We cut the various components apart and assembled our “sushi.” We made maguro and tamago, noting the fish and egg texture lines provided by the mold. 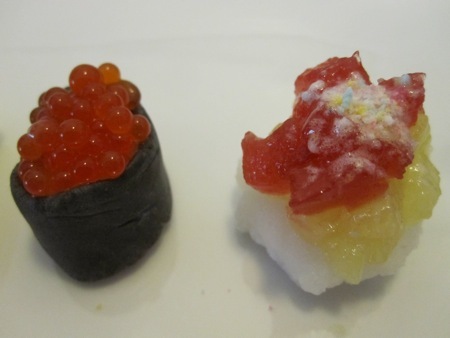 Then we moved on to the ikura and chirashi, where we learned that the mysterious purple packet was a garnish. They looked cool, but all tasted the same, that generic “fruit” flavor found in many Japanese candies and beverages. If you’ve ever had Ramune soda (or Irn-Bru, if that’s how you roll) then you know exactly how the candy tastes. It’s cute, it has an inoffensive taste, so what’s the big deal with this kit? It’s a gateway drug for modernist cuisine techniques. 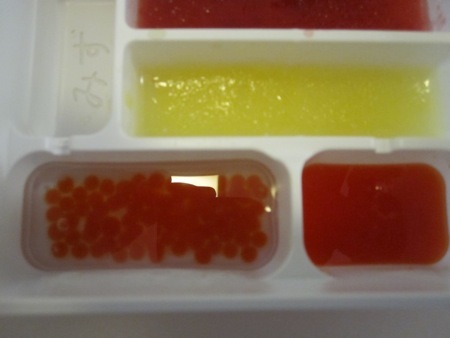 When you add part B to part A, you are dropping a calcium alginate solution into a calcium lactate solution, which results in spherification, a technique first utilized by Ferran Adriá. That’s right, for a measly five bucks you can emulate cuisine found at El Bulli, the best restaurant in the world. It won’t taste the same, but the process is identical. 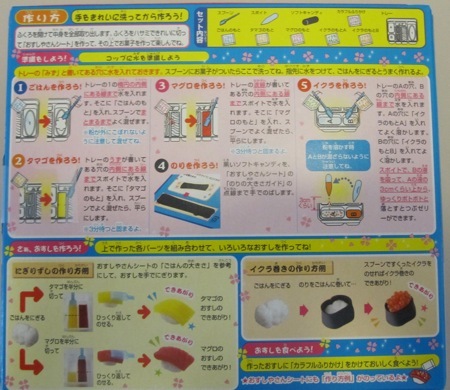 You also get a crash course in dispersing and hydrating hydrocolloids when you prepare the sushi toppings. at my disposal. 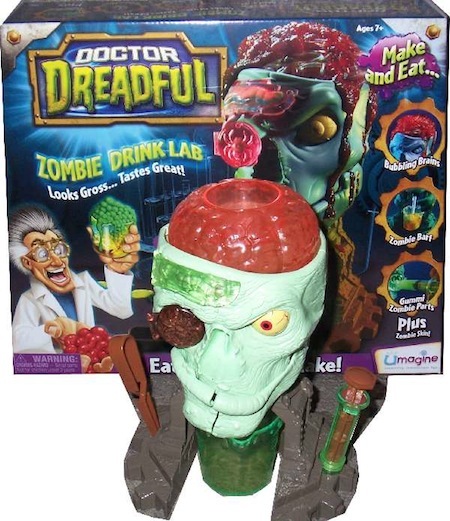 Until then, we’re eagerly awaiting the Zombie Drink Lab, one of the new additions to the recently revived Doctor Dreadful line. Boomzilla likes this Jap candy that’s like a little drug lab. You mix these different parts, it fizzes, gets hot, cools. You do this extrusion-molding thing and watch it harden. When you eat it, it’s just candy, but Boomzilla likes making it. I think “Baby’s First Hydrocolloid Lab” is more marketable than “Baby’s First Drug Lab,” but that’s just one man’s opinion. This entry was posted in culture, food & cooking, science and tagged food, science. Bookmark the permalink. The purple packet says karafuru furikake, which I had to stare at for a while before I realized it means colorful furikake. Furikake is a kind of granulated seasoning made of various things like seaweed and dried fish. Thanks for the translation. I have a jar of furikake, I use it for Spam musubi. The stuff in the packet was ground up candy, some of it fizzy. I tried to buy one at the local Wal-Mart, but they told me the entire supply has been shipped to Alaska, where they can’t keep them in stock. I’m waiting for Baby’s First Sous Vide or Baby’s First Gene Splicing Lab.